At Orthodontically Yours, we are committed to the health and beauty of your smile. Our doctors and highly trained team of orthodontic specialists are dedicated to providing high-quality orthodontic treatment to patients throughout Mississauga, Thornhill, and the surrounding areas, and we offer a wide variety of treatment methods to suit any patient's orthodontic needs. When possible, we strive to use the most convenient treatment method available. Thanks to an exciting advancement in dental technology called TADs (Temporary Anchorage Devices), we can now treat even severe orthodontic problems without the need for external headgear. While they've been in use since the 1980s, TADs are gaining widespread acceptance today – and the benefits they offer to orthodontic patients who need them are truly groundbreaking. They aren't necessary in every case, but when they are needed, they offer an incredibly compact and convenient treatment method. TADs are small, screw-like dental implants made from a titanium alloy that are placed into the jaw line above the upper teeth or below the lower teeth. As their name might suggest, TADs are temporary, often remaining in place for only a few months during treatment before being removed. Also as their name implies, the function of TADs is to provide an anchorage point around which we can move the teeth - and that anchorage is crucially important to orthodontic treatment. You can think of orthodontic treatment as similar to moving a stick through the sand. When you apply force to the stick, it moves through the sand, which essentially means that sand moves away and to the sides in front of the stick and fills in the space that the stick leaves behind. This is analogous to orthodontic treatment, but in orthodontics, the "sand" is the cells of the jawbone and periodontal ligament in which the teeth sit and the "stick" is the tooth itself. These tissues readjust each other slowly as force is applied to the teeth by braces, Invisalign, or any other orthodontic treatment. Orthodontic treatment isn't possible without an anchorage point – the force on the teeth needs a grounding point off of which it can base itself. Imagine trying to move a stick through the sand as you're floating in water – instead of moving the stick, you'd simply move your own body! However, with feet firmly in the sand, you can move the stick just fine. In orthodontics, we'll usually try to use the back teeth as anchors, but this isn't possible in every case. In the past, we'd need to use inconvenient external headgear to create an anchorage point, but with TADs, this is often unnecessary. While the back teeth are usually the best option for an anchor point, in some cases, it may not be possible to use them. This may the case if there isn't a viable tooth to use as an anchor, and if we need a greater force to move the teeth, the anchor teeth themselves may start to move, which we want to avoid. TADs allow us to move teeth without using the rear molars as anchors, providing a stable point off which we can push other teeth. TADs provide a small, unobtrusive, and highly stable anchor point for tooth movement, eliminating the need for bulky, irritating headgear. In addition to this, they can help to shorten overall treatment time, eliminate the need for elastics (rubber bands), and in some cases, may even eliminate the need for oral surgery! TADs also give us the ability to treat more complex orthodontic cases, allowing us to help more patients than ever achieve a beautiful smile. TADs are essentially miniature screws that are inserted into the jaws, which makes them fairly similar to dental implants – but the placement process is much easier than it is with dental implants. 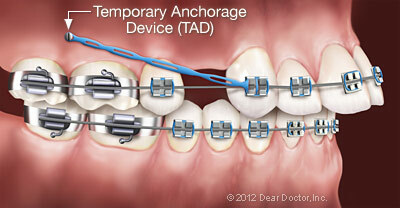 Placing and taking out TADs is a painless, minimally invasive procedure that doesn't require a general anesthetic. After using a local anesthetic to numb the area, patients getting TADs feel only a mild sense of pressure during the process of insertion, and the entire procedure takes only minutes to complete. While over the counter pain medication can be used to deal with any minor discomfort after the procedure, most patients feel no pain at all after having them placed – and removing them is an even easier process. While wearing TADs, you'll need to spend a bit of time every day caring for them. You'll generally want to brush them twice a day with a soft toothbrush dipped into a special antimicrobial solution, which we'll provide you with. We'll give you detailed instructions for maintenance once we place your TADs, and we'll take the time to answer any questions you may have about wearing them. Not every patient needs TADs, but for those who do, they make a big impact on the convenience of treatment. If you have more questions about TADs, the other treatments we offer, or your orthodontic health in general, we would be thrilled to hear from you. Feel free to call us at 905-820-6511 for our Mississauga office or 905-763-9098 for our Thornhill office, reach out to us at our contact page, or use our easy online form to request an appointment at either of our offices. We are excited to hear from you, and we look forward to helping you achieve a beautiful new smile!